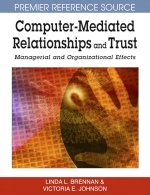 This chapter deals with how IT influences the different levels and types of trust that arise in business cooperation relationships. Trust is specially important for cooperation and communication is essential along its different stages. So, the role of IT is key for trust development, because IT offers greater possibilities of access to more and better information, and increases the chances of interaction between the agents who use these technologies. We analyze how IT can affect trust from different perspectives and typologies along the process of business cooperation which begins with the initial decision to cooperate, and follows with the selection of potential partners, the negotiation and structure definition, management, evaluation and relationship evolution. At each stage we comment some possibilities of promoting different trust types through IT to improve cooperation performance.